The number of Texans registered to vote in the state’s five largest counties increased by 2 percent since 2012, a reversal of the decline in total voter registrations that was seen before the last midterm election. Nearly 150,000 more Texans in these counties are eligible to vote in November’s election between Greg Abbott and Wendy Davis than could vote in the 2012 presidential election, according to tallies released by Harris, Dallas, Tarrant, Bexar and Travis counties midday Monday, the last day to register. The new registrations, however, did not outpace population growth in these counties, which are expected to have grown by 2.6 percent since 2012. But population growth has not always meant growth in voter registration totals: Following the registration push that helped elect Barack Obama in 2008, voter registration in these counties declined by 140,000, a 2.5 percent drop ahead of the 2010 midterm election. Ahead of this midterm cycle, where Republicans are again favored up-and-down the ticket, that trend seems to have been flipped as 2.2 percent more Texans are registered to vote following Obama’s second campaign in these counties. Roughly 5.9 million Texans can vote in November’s races in these counties, where more than a third of Texans live. Voter registration groups hailed the uptick in registration before a midterm election, which traditionally sees much lower turnout than during presidential years, as evidence that their efforts to register low-propensity voters had paid off. 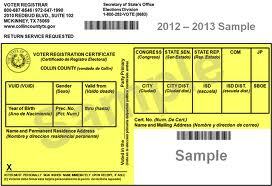 Five percent of those voting in Harris County are new registrants. Jim Henson, who directs the Texas Politics Project at the University of Texas at Austin, cautioned against reading too much into voter registration numbers, especially as they relate to the success of Battleground Texas. The group has made clear it views its work as long term. I’ll stipulate that we should wait till voting actually starts before we begin to draw inferences, let alone conclusions, but come on. Battleground Texas made increased voter registration a key part of their strategy, and the numbers bear them out. Lord knows, if the totals had shown the typical dropoff from a Presidential year everyone would be lining up to throw rocks at them, with the likes of Jim Henson being right at the front of the line. They did what they said they were going to do, so credit where credit is due. All past year figures are taken from the respective county elections websites. Kudos to the Dallas and El Paso elections admins for having up-to-date registration totals right there on their homepages. The Harris numbers for 2014 are taken from last week’s press release, so they may be a tad low. The 2014 Bexar number came from this KSAT story. As for Travis and Tarrant, I called and asked. Any or all of the 2014 numbers may change between now and Election Day for a variety of reasons, but ballpark figures are more than adequate for my purposes, which is why I rounded off the “difference” numbers in the last column. I went back three election cycles so you could see more clearly the difference between this year and 2010. Note how in each county except Harris – where as we know there had been a concerted effort to register voters, until Greg Abbott crushed it – the numbers declined, in some cases precipitously, from 2008. In Bexar, Dallas, and El Paso the numbers were still down from 2008 for the 2012 election. In all cases except Dallas, registration totals have surpassed 2008, and the gains over 2010 are substantial. Sure, the overall population in these counties is up as well, but as you can see that has not correlated to voter registration totals. You can make of this what you want to, and I readily agree that it’s the turnout numbers that will really matter (*). But this is yet another piece of evidence to suggest that this year is different than 2010. We don’t know what the final effect will be, and if it falls short of expectations that will be more grist for the postmortem mill. However you want to slice it, these are the numbers we have. (*) It’s an interesting question, what kind of turnout we should expect from newly-registered voters. I’ve heard it said that voters who register for a specific election turn out at rates that are at least commensurate with the voting population at large, but a cursory Google search hasn’t turned up any definitive info on that. Perhaps this would be a good topic for a professional political scientist like Jim Henson to research, with this election serving as a juicy case study. Who knows, maybe he’ll learn something that might lead him to refine his polling methodology.